Following on from yesterday's Q&A with LAS Group's Les Smith, today Urban.com.au chats to Stephen Javens, Director of K.P.D.O, the architects responsible for designing One Wellington's external form and also the interiors. Urban.com.au: The site came with an existing permit for a multi-storey residential development. What was the brief from LAS Group for One Wellington and how significantly was the permitted design changed? Was it a matter of starting from scratch within the endorsed envelope? Stephen Javens: Our starting point was to address the geometry of the architecture. The permitted building was quite square in plan, with rounded corners. We saw an opportunity to soften the architecture, by creating organic forms which would be articulated by the passing of the sun from dawn through to dusk. The site has full solar exposure for the entire day, so the way the sun moves across the façade was a key design element. U: One Wellington forms a gateway entry statement to the St Kilda Rd south precinct, was this a key consideration when designing the project? SJ: Yes. At the turn of last century, St Kilda Junction became a vibrant urban place, with significant buildings, trees and pedestrian life. The old Junction Hotel was a gateway building to St Kilda (and when St Kilda won a game, they’d run a flag up the flagpole). 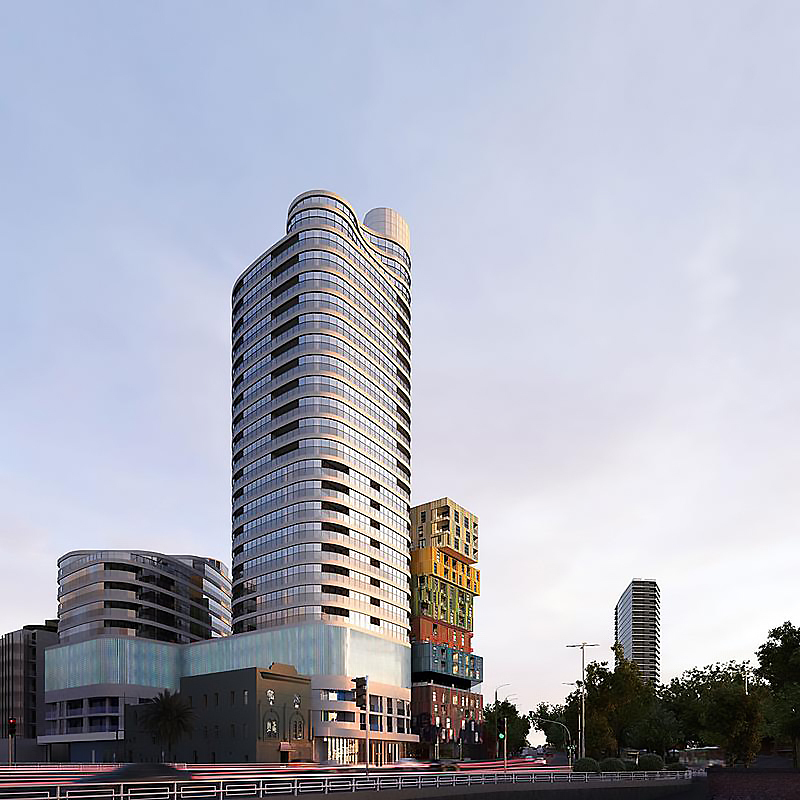 One Wellington aims to add to the vibrancy of St Kilda and surrounds. U: What were some of the key design drivers for the development? Providing flexible floor plates for ease of apartment amalgamations. Maximising views to the bay, city and Dandenong. A simple refined expression based on organic form. Restraint in architecture and exuberance in the public spaces. The tower has been designed to subtly change its expression as the sun tracks across the sky. One Wellington will have a pink glow when it reflects the dawn sky, then silvery blue during the day then dusky orange as the sun sets. U: How does the design of One Wellington respond to ICON to the south and its proximity to Albert Park? SJ: ICON is a great example of expressive formalism. We wanted to be a good neighbour and be slightly quieter in the sky. One Wellington is expressed through sweeping organic form. We wanted to have a conversation with our neighbour, rather than an argument. U: The site also has its challenges being located at St Kilda Junction, surrounded by roads carrying significant traffic volumes. What were some of the design features employed to address noise and pollution concerns?